I never thought that I was a cowl person, but when I saw this cowl I decided to give it a try. It's simple, it's effective, and it's the perfect opportunity to use a pair of fantastic buttons that I bought at the Purple Purl. Here's a close up of the buttons, I wish I had a never ending supply of them! I bought a skein of Malabrigo to knit this pattern in, it's a beautiful wine shade, and though I love it, I decided to knit it with yarn I already had in my stash, it's Elann Peruvian Highland wool , it's certainly not as soft as Malabrigo, but it matches my hat and mitts and ties the whole look together and makes me actually match! I'm not really a stickler for matching winter accessories, but I do feel more put together when I wear this combo. It's almost as if I planned it! Voila! 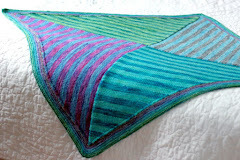 A finished object that I've been planning to blog about for over a month now! I'm on a role! So, here we have the drops jacket, knit in Elann Peruvian Sierra Aran in the Atlantis colourway. I knit this in just under two weeks in December, a really fast and fun project. I got a lot of wear out of it around the holidays, it's just the thing you want to throw on with a pair of jeans. The colour is rich and jewel toned, the yarn is soft and warm with just enough wooly/alpaca fuzziness, and the shape is flattering yet casual. A real hit! I'm not sure how exactly the collar is supposed to fit, mine kind of just sits there, but I like it. I found the nicest purple wood buttons at the Purple purl when I was in Toronto last weekend (such a great store by the way! And they carry my yarn too, which makes them the best!) I had different buttons on this sweater before, it was such a fast knit that I was done and eager to wear it, so just sewed on some buttons that I had even though they were only going to be temporary. 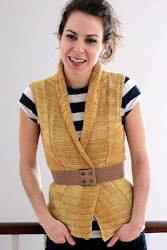 I love how these wooden buttons finished off the sweater. They're special, but simple and rustic/casual too, a perfect fit for this sweater. I thought the colour of the wood really complimented the colour of the yarn... but alas, I only got to wear my perfect finished sweater long enough to take the FO photo's before I had to rush off to work, in my haste I left my beloved sweater with perfect buttons on the couch, and when I came home from work the buttons had all mysteriously been chewed off. Stella really got an ear-full from me! At least she was smart enough not to harm any of the knitting, just just neatly chewed off the buttons and then left the sweater as is. So, I guess that my hunt for more perfect buttons continues... Buttons really can make or break a project. I think I may be developing a need/desire for a button stash. This photo doesn't really do the late purple buttons justice, just trust me, they were breathtaking in real life. Enough about buttons, now on to socks. 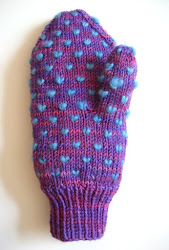 I seem to have inadvertently started a tradition where I knit Chris a pair of socks over the Christmas holidays. 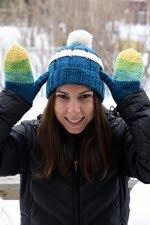 There's always so much going on during the holidays and I need a small, easy, portable project to work on while I'm enjoying time with friends and family, socks are just the thing! And since Chris's birthday is on January 4th, knitting him socks over the holidays usually results in a birthday present done just on time! Here is this year's Christmas/birthday socks. They're knit with On Line supersocke in colour 1060, it's not really my colours, all that mustard and orange, but Chris thinks they're just great, so everyone's happy! For Christmas, my mom gave me Norah Gaughan Vol.3. I knew I was getting it, because I was with my mom when she bought it! There are a couple patterns that I like in it, but the reason I really had to have it was for Assemblage. The cable pattern is just so pretty I can't stand it! I was so excited to cast on I ordered the yarn from Webs before Christmas hoping that it would arrive shortly after Christmas so I could cast on immediately. And it did! So, I've been working on it on and off all month (it's been a busy month) and I've got a back and one and a half sleeves. By the end of this weekend I hope to have the second sleeve finished and a good start on the front. 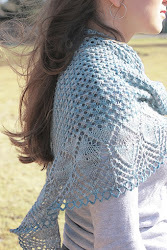 I'm knitting it using Valley Yarns Northfield in the Haze colourway, and I love it! It was a bit of a gamble because I'd never used it before, and considering the fiber content (70% merino, 20% baby alpaca, 10% silk) I thought that it was a really affordable, maybe too affordable. But so far I think it's a great match for the pattern. It has really nice stitch definition, unblocked the cable pattern already looks amazing, and the colour is really nice and soft. I think this is going to be a hit. Here's a close up of the sleeve cuff's, so pretty! I went on a weekend trip to Toronto, and since I needed something really portable and easy to pick up and put down I cast on for a new sock. In the ball, I thought that I would love this yarn knitted up, but so far I'm not crazy about the way the colours are stripping. The yarn is Regia Canyon colour #2804. I don't like how the stripes are so regular, the colours are pretty, but it's just kind of boring. I prefer random stripes, they just appeal to me more, less perfect. Maybe they'll grow on me. Or maybe they'll end up gifted. I actually have been wearing this FO for a couple of months already... for me it seems that knitting the project isn't the hard part, it's the photographing, editing and then posting about it that gets me all backed up! I cast on for these lovely orange monkeys immediately after I finished my first monkeys back in October. I really liked the pattern, but didn't find that the yarn used for monkeys #1 really showed it off properly, I thought that this yarn would be a much better match. It's Tanis Fiber Arts Blue Label in Orange Blossom. I think that these socks rock. It really goes to show what a difference yarn selection makes in the final result of a project. On a whim the other day I decided to pull out my sewing machine and some scraps of fabric and literally whip up a small project that I've been contemplating making for a while. It's a sweet little pin cushion. It's cheery and festive, and since I didn't have one, I figured I should make one. It's so exciting when you can take some scraps that you've got leftover from a more "important" project that merited actually buying fabric for, and put them together to make something so sweet and uplifting. (Is it weird that I find pin cushions uplifting?) Anyways, I love it and can't wait to have a studio with a sewing table to sit it on one day!